White SGO Iron Art adds interest and a light look to this door. A great combination of bevels and textures create an interesting design. This beautiful bevel design adds privacy. This lighthouse design was done to reflect the nautical design of the wallpaper. This window adds privacy from a neighbouring window. The design in this window co-ordinates with the bathroom tile. A beautiful piece of art for a bathroom window. Contemporary styling in a powder room. A combination of UltraSea and UltraCrinkle by Ultraglas. A design winner from SGO of Milwaukee. A unique shower in Ultraglas Falling Squares design. Extending the design across all three windows is an interesting possibility. Stained Glass Overlay adds interest to this clear shower door. A combination of Ultraglas patterns Starburst and UltraSlate. Both charm and privacy are achieved in this bathroom renovation. 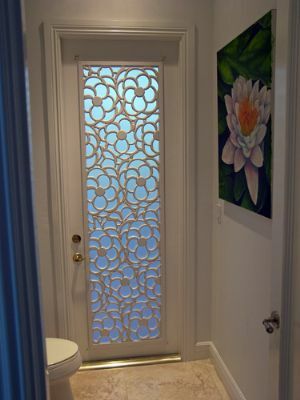 A beautiful combination of SGO Iron Art with Textured Glass for privacy. SGO Iron Art in a window compliments the iron accessories in this bathroom. It is easy to add interest without blocking the view with SGO Iron Art. This window does a great job of hiding the brick wall & window on the neighbouring house. A much nicer view for the powder room than a brick wall - without blocking the natural light. SGO Iron Art enhances this setting. Combined textures by Ultraglas add interest to this shower door. These lovely bevelled windows allow natural light to flow while adding privacy in the bath. SGO Iron Art is mounted in the windows and in front of clear glass between the shower and tub area. Textured glass supplies the privacy, while leadwork adds interest. This beautiful bevelled design would add sparkle to any room. Slumped glass does an excellent job of providing privacy without blocking the light. Now they can keep the blinds open! Both elegance and privacy are maintained with this beautiful window. Carved glass makes a beautiful divider for the bath. A beautiful combination of carved, back-painted and clear glass. Carved glass enhances this shower door. Carving on the mirrors can be seen in the background. Traditional Stained Glass made into an insulated window adds beautiful privacy. A contemporary design incorporating beautiful Vetro glass tiles. Dreamwalls Marble Glass on the shower walls. There are many Mirrormate Frame styles to choose from. Mirrormate Frames add style to your plain mirrors. Mirrormate Frames add elegance to the bath.